The Metropolitan Museum of Art has a jam-packed Web site, where you can browse highlights from its holdings or search for specific items. The MetMedia section of the museum’s site hosts videos, audio podcasts, interactive quizzes and a kids section. The MetShare page has links to the Met’s various social media and mobile efforts, including its contributions to YouTube, Flickr, iTunes U, plus its Twitter and FourSquare feeds. If you use the Google Goggles app on your iPhone or Android handset when you visit the museum in person, you can take a picture of an object and have the app recognize it and taker you to a page of information about it on the Museum’s Web site. The Met has created specific apps for special exhibitions, like its Guitar Heroes show a few years back or its standing Arms & Armor collection. The Web site for The Museum of Modern Art here in New York has a collection-search feature, a dedicated online collection with objects that may not even be on regular view in the physical galleries and, (as shown below), mobile apps for iOS and Android. If you visit in person, there’s also free WiFi inside the museum itself. The Art Institute of Chicago has a nicely designed site you can use to search the 54,000 items in the museum’s collection, a multimedia finder, several iOS and Android apps and a feature that lets you make your own collection out of its holdings. 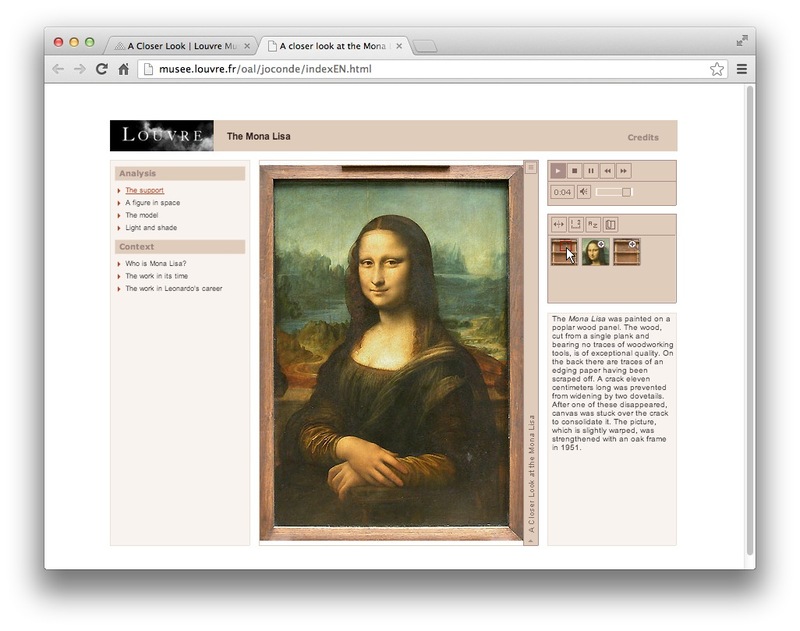 You can also take an online tour of the Louvre, the famous art museum in Paris and home of the Mona Lisa, shown below. The museum has a free iPad app as well. The Smithsonian Institution in Washington DC, which claims to be the world’s largest museum and research complex with 19 separate museums, a national zoo and 137 million artifacts in its holdings has a one-stop search page where you can comb through 8.1 million catalog of digital records, the Smithsonian libraries, its archives and even Smithsonian Folkways, the record label that specializes American music. The Smithsonian Institution is all over most forms of social media, has its own virtual world and has apps for iOS and Android, along with a mobile Website for other phone platforms. The Library of Congress site has its own digital collections, where you can see digitalized images of things like early baseball cards, examine archived newspapers and hear more than 10,000 old 78rpm discs from 1900 to 1925 that were converted to MP3 as part of the National Jukebox Project. 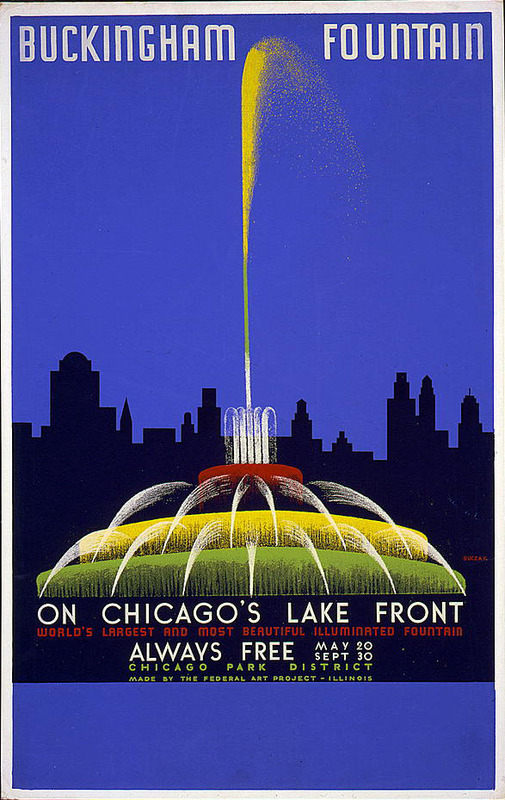 In the Prints & Photographs Online Catalog area, you can see and download digital copies of about a million images in the Library’s picture archive, including the poster for Chicago’s Buckingham Fountain from the WPA collection that’s shown here. As for mobile apps, you can get the daily Congressional Record or a virtual tour of the Library of Congress for iPhone or iPad, and interactive book of Aesop’s Fables for Android or iOS. 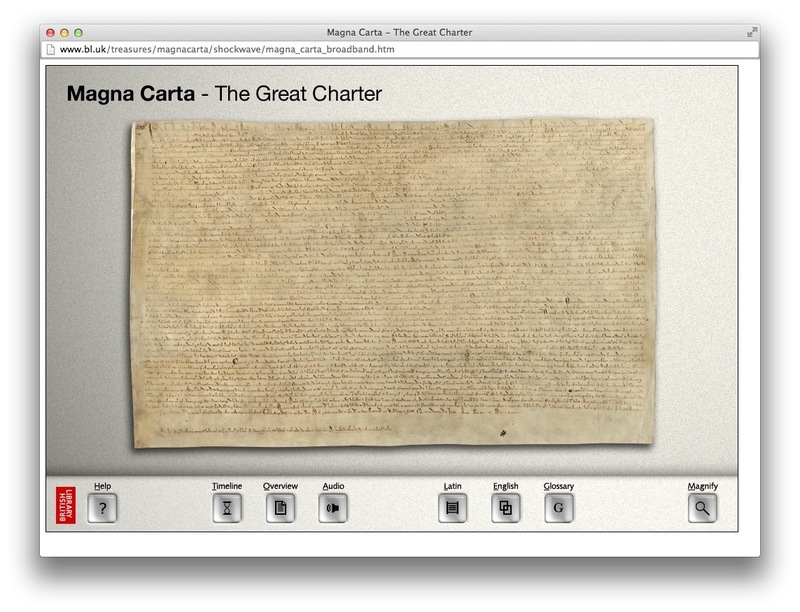 Across the pond, The British Library, which also rounds up the knowledge of the world, has many wonderful online galleries, including a Magna Carta section where you can see the Great Charter (shown below) up close. The site even offers a highlights slideshow tour and various virtual exhibitions. The Library has a handful of inexpensive mobile apps for Android and IOS devices that highlight some of the gems in its collections. The British Museum, also in London, has blogs and videos that highlight parts of its extensive collection, and you can even search the museum’s database and check out the Rosetta Stone and other well-known historical objects. You can find apps for special exhibits, like the Android and iOS app for its Pompeii and Herculaneum show; these costs about $3 or $4. There’s also an learning section for kids and an online shop with a place to order prints of artwork in the Museum. In fact, most museum sites include a link to their online stores, so as in the real world, you can leave through the gift shop and pick up a few souvenirs.